With a week left of summer before we head back to school, I feel this crazy amount of pressure to squeeze in all kinds of summer fun! Last Friday, I took the kids to Funtown/Splashtown. We picked the perfect day for our trip, it was warm but not overly hot and I'm thinking everyone had fun. 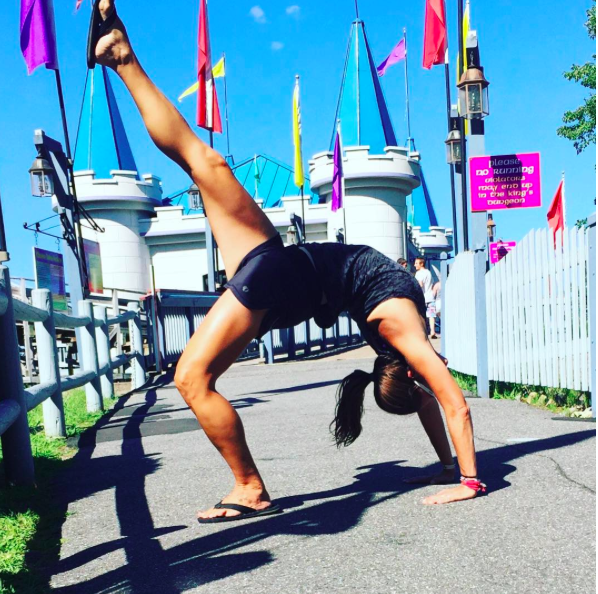 wheel pose while the kids are on the rides? of course! Izzy tried out driving for the first time. She took this responsibility quite serious. scraping is definitely a workout.... a #weirdworkout for sure. I'm so sore! We've been wanting to paint the house all summer long. So waiting until the last week of summer to start the process seems completely logical. Right? In my opinion, we seriously have until November to finish this project anyway. And it's weird... the entire time I felt like I was being watched. I kept hearing this Michael Jackson song over and over again in my head. Yep. Mallie is always watching me. She wants to be with her people! Of course, it only made sense to run on the treadmill, in red, white and blue while watching the Men's Olympic Marathon. And you would have thought I was watching football or something. I was totally in it. Cheering when Rupp and Meb were in the front of the pack.... screaming NO! when Meb was on the side of the road. All. Completely. Normal. After some more paining and scraping we headed off to the cottage for some tubing fun. This time behind the jet skis... which was a huge favorite for my girl. The view from the cottage is quite amazing. We spied a sailboat out there after dinner. Tell me, do you think scraping and paint the house is a workout? 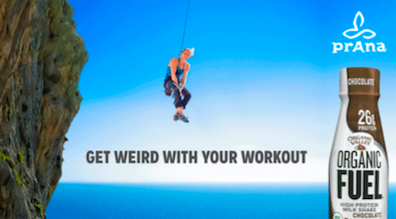 It may be a #weirdworkout, but to me, I think it is! I invite you to share you own #weirdworkout. There are 6 ways to play and 10 people will win! The contest runs from August 15 – 31st, 2016. 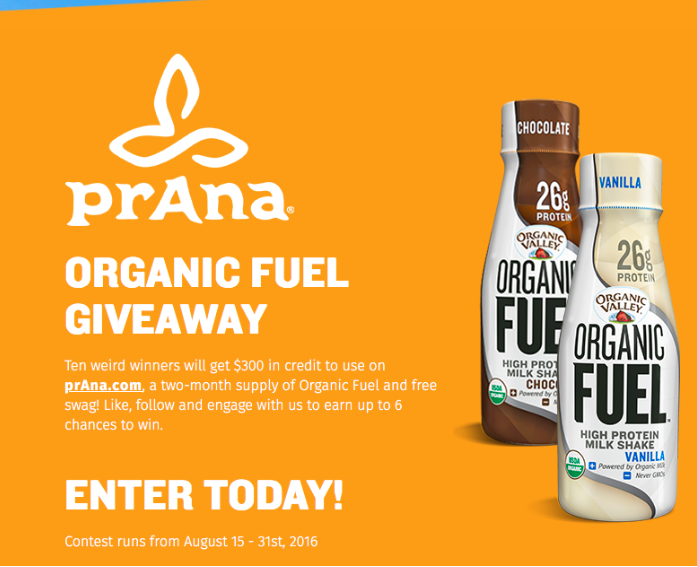 Ten winners will swing away with some awesome Organic Fuel swag, a two-month supply of Organic Fuel and $300 in credit to use on prAna.com! Enter HERE! After entering the contest, print also help yourself and print off a coupon for Organic Fuel. 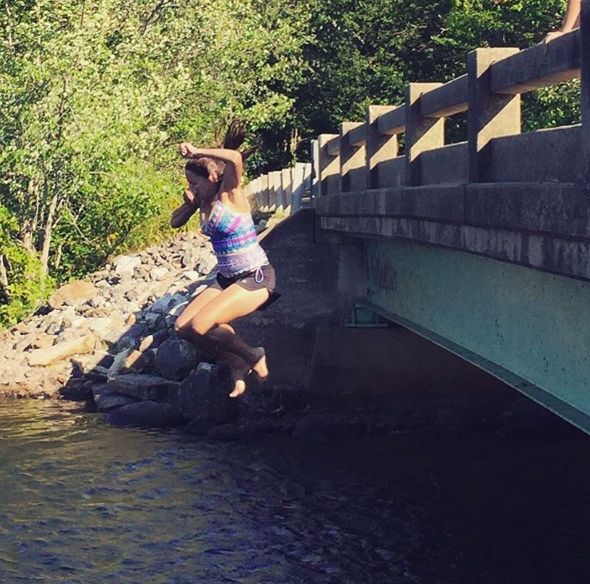 bridge jumping a workout? sure! I sure love my prAna clothing. I might be addicted. This summer I've been in love with my prAna swim top. So cute and flattering. When I go back to school, I'll be living in my Kara jeans once again... and I've added a couple more colors to my collection! I'm so excited to wear them again! Enjoy 15% off the Fall Line at prAna with code PFS16RWTG, which expires 10/31/16. A portion of this post is in partnership with FitApproach, prAna and Organic Valley. As always, all opinions expressed on my blog are 100% my own.